This newspaper article dates exactly 100 years ago today. It discribes the turbulent times Mount Athos was in at that time. The issue of the protectorate over the monks republic Athos is resolved in favor of Greece. The fall of Bulgaria, which also claimed that protectorate, and having an infantry company in the Bulgarian monastery Sografou and a large military force in Saloniki, to assure themselves of the protectorate, has accelerated the solution. The Russian landing groups that were sent to Athos, because a dispute broke out between Russian monks about a dogmatic faith issue, again left for Odessa, taking several hundred heretical monks back, who now face a spiritual court to justify their heresy . The Greeks maintained in Karyes and by a wise action managed to solve the disagreement among monks and to make way for understanding. The abbot of the Russian skite St. Andreou and that of the Greek (?) monastery of St. Panteleimon offered to the members of the Board (Holy Epistatia) in Karyes a dinner and afterwards the unity and friendship of the monks and monasteries were sealed. The request to the conference in London of the elders (Gerontes) of the Slavic-Romanian cells, in order to elevate cells to Skites and Skites to monasteries and thereby expand the number of members of the Epistatia in Karyes, is not even treated. And because the Greeks have the majority in the Holy Epistatia, and the Russians no longer seem to oppose the Greek protectorate, the Greek tutelage of Mount Athos is assured. This photo was taken one day earlier, on September 10th 1913: by Stéphane Passet. 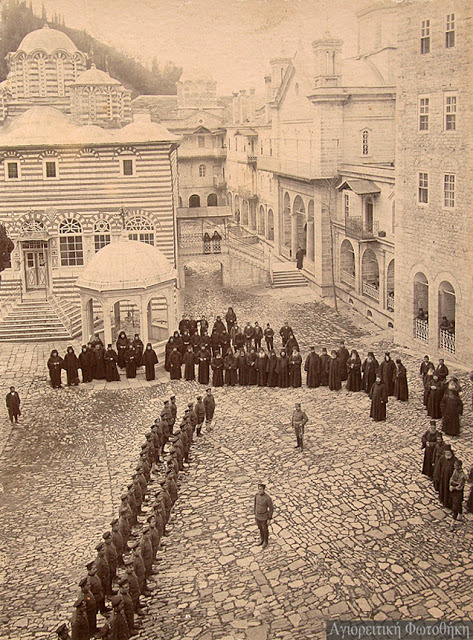 “This disturbing image given the wider historical context was taken in the weeks after the Second Balkan War near the Grand Lavra monastery on Mount Athos”. 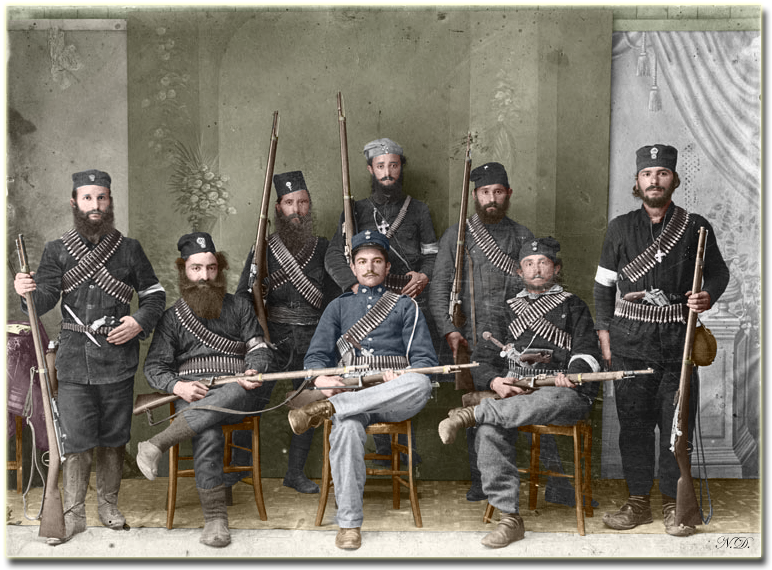 1913: a colourised photo showing guards of a Greek monastery in Mount Athos after having repelled Bulgarian invaders (1913). Some are possibly monks and there is one Gendarme among them. This entry was posted in history and tagged 1913, Bulgarians, russians. Bookmark the permalink. 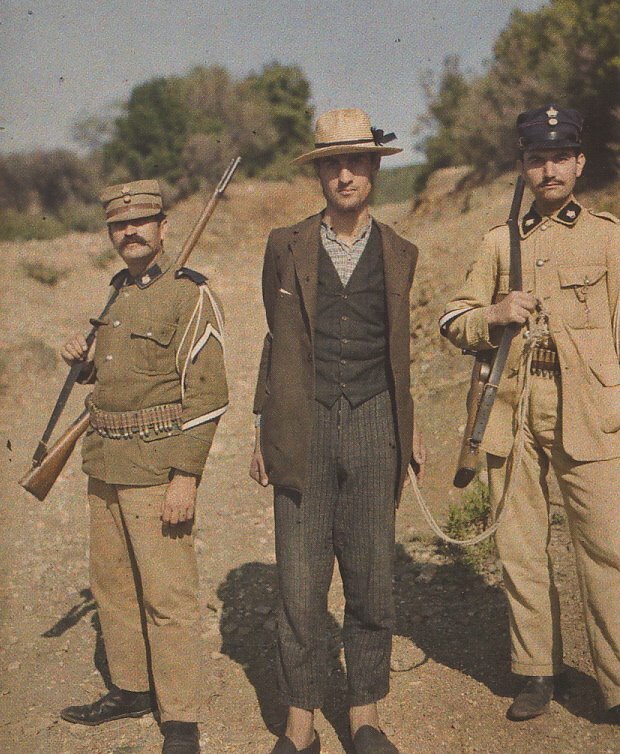 Correction: the 4th picture depicts not Bulgarian troops, but the company of sub-lieutenant Konstantinos Vergogiannopoulos. Bulgarian soldiers, prisoned in I. M. Zográfou surrendered to him. (text picture). 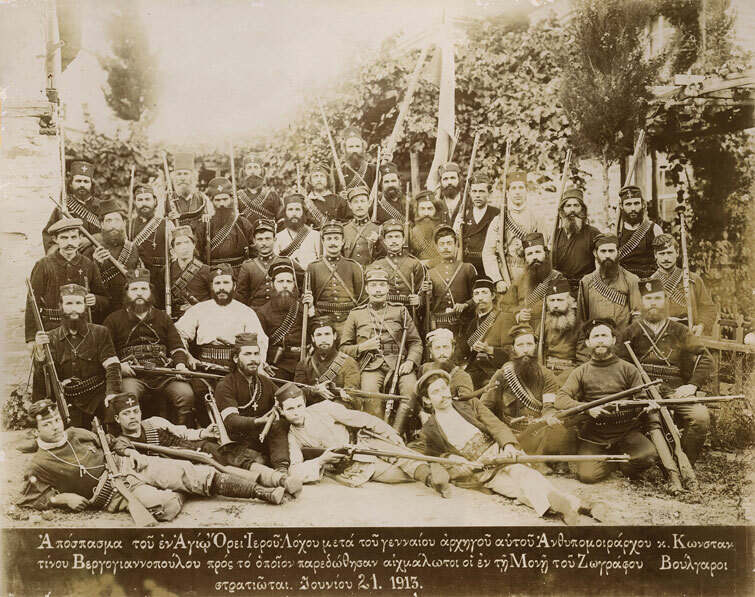 Besides, a picture of Greek troops in this situation is more likely than a picture of Bulgarian soldiers, I think. are wearing Bulgarian uniforms. He is the only one dressed as a Greek.